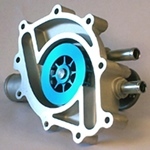 FlowKooler water pumps unique impeller designs prevent engine overheating through higher flow rates. Gasket included. 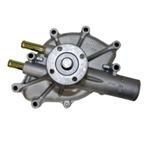 FlowKooler hi flow water pumps resolve low-speed heating problems by doubling flow rates at low rpm and idle (which is perfect for off-roading). CNC precision machined impellers feature larger diameters, increased vane count, tighter clearances, shrouding and porting. These unique design features help drop engine temperatures up to 30 degrees, increase the block pressure to prevent hot spots on cylinder walls and stop the formation of steam pockets in the block all while delaying the onset of cavitation at higher rpm. Impellers are protected from electrolysis and corrosion with a Type II Class II Military Grade anodized surface coating. From 0-3,000 rpms…Nothing Beats a FlowKooler! Independent testing by a major engineering university and the world's largest automotive manufacturer has proven FlowKooler pumps outperform all other makes at low speeds. One more added bonus is that the aluminum water pump weighs considerably less than its cast iron counterpart. 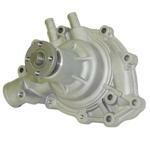 This model is a 86-93 Mustang 5.0 Serpentine water pump for the 5.0 conversions. This pump is reverse rotation with a driver side inlet. The FlowKooler Mustang Water Pump is just the ticket to keep my 5.0 EFI running cool at low speeds! !